"Best homemade Italian beef I have ever had. My mom always made it and passed it down to me, I think it's just so good...I wanted everyone to enjoy it...so please do!" Place the roast into a slow cooker, and season with Italian dressing mix. Pour in the water. Cover, and cook on High for 6 to 7 hours. During the last hour, shred the meat with two forks - if it does not shred easily, cook longer. Add the peppers, and as much of the juice as you like for additional flavor. Serve on buns. 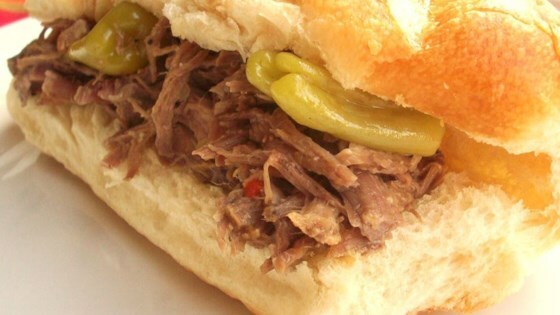 Make tender, delicious, slightly spicy Italian beef in your slow cooker.